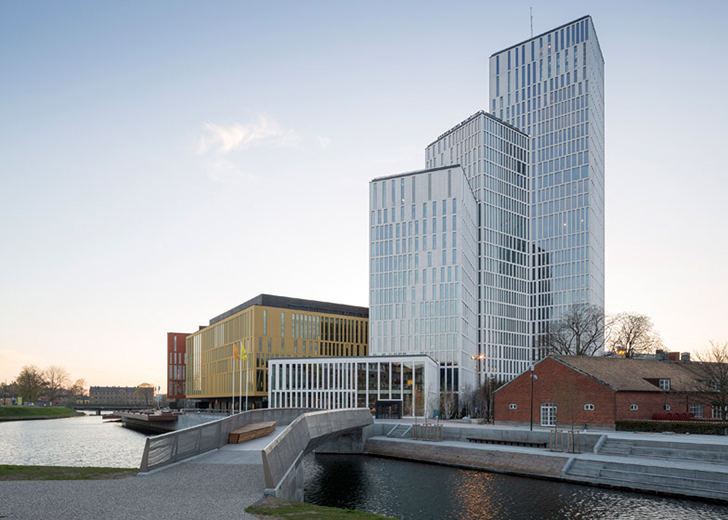 Danish architecture firm Schmidt Hammer Lassen completed a part of the culture complex in Malmö, Sweden, which includes spaces from skating, public big screen and a new promenade along the canal located to the south of the development. Inspired by the layout of medieval cities, the complex creates a mix of different public spaces and narrow streets. The Malmö Live cultural complex is located on an island to the north-east of the city center and covers an area of 54,000 square meters. It is broken is several smaller parts in order to blend into its urban surroundings, but the volumes clearly interact in a visually hierarchical way. Rectangular layouts of the volumes are extruded to different heights that somewhat correspond to the height of the neighboring buildings. Besides the a 1,600-seat concert hall and conference center, the complex includes three hotel towers that have a separate entrance and include 444 rooms with a spa, a gym, two restaurants, a cafe and a top-floor bar. 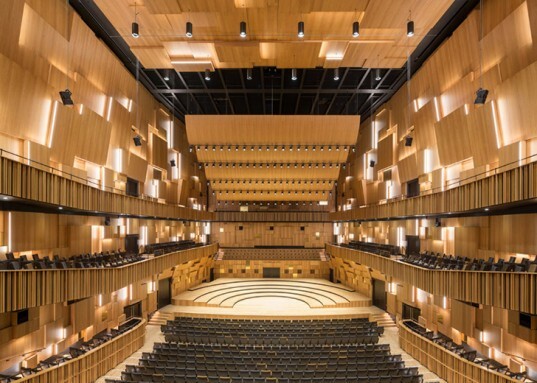 The completed section of the complex opened this month and the concert hall is scheduled for completion by August. The Malmö Live complex is located on an island to the north-east of the city center and covers an area of 54,000 square meters. It is broken is several smaller parts in order to blend into its urban surroundings, but the volumes clearly interact in a visually hierarchical way. Rectangular layouts of the volumes are extruded to different heights that somewhat correspond to the height of the neighboring buildings. Besides the a 1,600-seat concert hall and conference center, the complex includes three hotel towers that have separate entrances and include 444 rooms with a spa, a gym, two restaurants, a cafe and a top-floor bar. The completed section fo the complex opened this month and the concert hall is scheduled for completion by August.